Last year, a rumor surfaced that Warner Bros.' standalone Wonder Woman adventure will actually be a prequel, set in the 1920s during World War I. 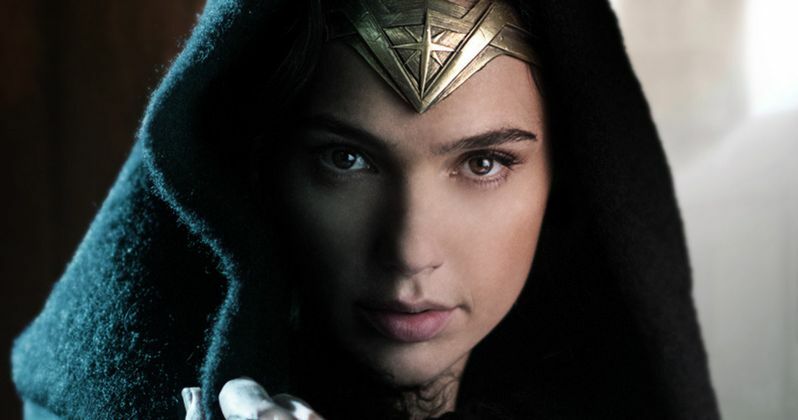 Another report surfaced last month that also claimed part of the movie is set in this time period, with another portion of the movie set on Wonder Woman's home island of Themyscira. The majority of the story is said to take place in present day. These rumors were never officially confirmed by the studio, but today we have new set photos from The Daily Mail, which feature Gal Gadot, (Diana Prince/Wonder Woman), Chris Pine (Steve Trevor) and Ewen Bremner in their World War I costumes. Earlier this month, the first set photo surfaced, featuring Chris Pine as Steve Trevor and Saïd Taghmaoui as an unidentified character, both of whom were wearing costumes that seemingly confirmed the World War I setting. One of the new images released today features a sign that reads "Your King and Country Need You Enlist Now," a slogan that was widely used by the British government to encourage young men to enlist for the war. We also see another sign that reads "French Money Exchanged Here," which indicates that these troops are returning home after doing battle in France. Last week, Warner Bros. officially announced that production has begun, while revealing a number of new cast members, including Robin Wright, Danny Huston, David Thewlis, Ewen Bremner, Saïd Taghmaoui, Elena Anaya and Lucy Davis. Unfortunately, no details about their characters have been revealed yet. Earlier this month, a rumor surfaced that Nicole Kidman was in talks for an unknown role in Wonder Woman, described as a "high-ranking Amazonian warrior." There was speculation that the actress could be playing Hyppolyta, the biological mother of Diana Prince. However, Nicole Kidman wasn't mentioned in the studio's official press release, and The Daily Mail speculates that Robin Wright may have taken over the role that Nicole Kidman was being eyed for. That hasn't been confirmed yet, so we'll have to wait and see who Robin Wright may be portraying. There were also rumors that Sean Bean and Eva Green were playing the main villains Ares and Circe, but their involvement hasn't been confirmed either. Patty Jenkins (Monster) is directing Wonder Woman from a screenplay by Jason Fuchs (Pan), with Charles Roven, Zack Snyder and Deborah Snyder producing. It isn't known how long principal photography is expected to last for, but shooting is scheduled to take place on location in the UK, France and Italy. While we wait for more details on Wonder Woman, take a look at the latest set photos below.